"George O'Day was one of America's most brilliant sailors, having won a Gold Medal in the Olympics... The company he founded probably did more to get people involved in sailing than any other, with such boats as the 17' Daysailor. With the growing popularity of sailing as a family sport, O'Day drafted a family version of the Rhodes 19 - the Mariner. They added a good-sized cabin and redesigned the deck. The first Mariner was built in 1963 and was O'Day's first venture into the cruising market. The rig on the Mariner was switched to a simpler single spreader design. So the boat could go anywhere, a cast iron centerboard was made an option, and over the years the centerboard model became the more popular." Mariner is still made by Stuart Marine of Rockland, Maine. A better deal is to buy one used on ebay or Craig's list. They go for $2000-$4000 depending on condition. For parts contact DR Marine in Assonnet, MA. Owner Rudy Nickerson used to work at the O'Day factory and has every part you need and knows everything about O'Day boats. Why is it named SynTropical you ask? It is a combination of SYNTROPY and TROPICAL. The Tropical part is fairly obvious. When I am sailing I always think of being in the Caribbean or tropics somewhere with Palm trees swaying, warm breezes blowing, drinking coconut milk, etc. Syntropy is Buckminster Fuller's word for the opposite of entropy which means chaos, randomness, and disorder. If you knew how much work it took to restore this 1977 sloop, you would understand. Life itself is a form of syntropy, or if you prefer synergy. Why only a 19' boat? Wellfleet Harbor is extremely shallow at low tide, and this boat draws only 10" with swing-keel up. Larger boats with fixed keel can only sail around high tide, and we can sail on any tide. Also, we can go right up on the beach for picnics. But it has an 8 1/2 foot cockpit which can carry six people. 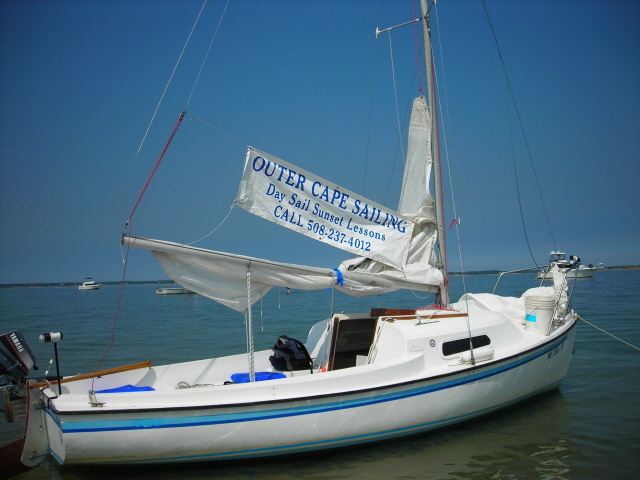 We also offer the US Sailing Small Boat Level One course which requires a boat under 20'. "A hole in the water you throw money into"
"Sailing is like standing in a cold shower with your clothes on ripping up $100 dollar bills"
Repair rudder bolts, wire, pivot bolt, etc. New bow eye for trailer winch: Stainless. replace outboard pivoting rod with SS, and plastic mounts. Sloop #1 "Syntropical"- 1973 Vanderstadt and McGruer Siren 17. Sold 2006, still sailing in Lake Champlain. "Different van de stadt- this one was penned by Hugh, the nephew of the more famous EG, and IMO the most successful 17' pocket cruiser ever, at least as far as introducing folks to sailing and KEEPING them sailing. Every Siren that has been slipped on the Dock in recent memory has been owned by novices who bought them "to try sailing and see if we like it" who then sold their boats after a season or two and moved up to larger rides. As an aside, all of those Sirens sold for at least what their owners paid for them: it's the only cruising boat I have ever seen with zero depreciation. They are relatively stable for a boat that size, comfortable for occasional overnighting (if you can find one with the optional boom tent, they make a respectable family camp cruiser) with enough sail area to be sporty without feeling like you're always sailing on your ear. Completely superfluous trivia: The Siren was the product of the incestuous "prodigal sons" boatbuilding industry in Owen Sound Ontario in the 60s-80s. Just as Hubert van De stadt is not THAT van de stadt, the McGruers involved in the process, Alex and Fraser aren't THAT McGruers, their better known ancestors from the UK. Van De stadt and McGruer and McGruer and Clark were responsible for designing and/or producing some enduring cruising designs, such as the Grampian 23, 26, 30, 34-2, the Challenger 24, Georgian 23, Sirius 21/22, 28, Seaforth 24 in addition to the Siren and the fun little Skunk."